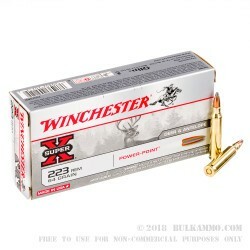 A great ammunition for your bolt action .223 rifle for deer, antelope and anything smaller. The 64 grain PowerPoint projectile is a very good bullet with a tradition for taking trophies that’s been built over decades. 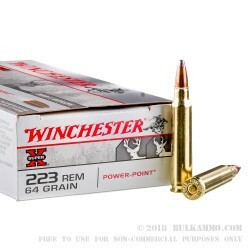 The soft point 64 grain projectile is sufficient to down the whole range of deer in the United states with the potent energy and velocity delivered from this load. 3020 feet per second of muzzle velocity and 1296 ft. lbs. of energy means this is potent for the game it is listed for. The light recoil for such a powerful round means it is easy to use for all shooters and the round has enjoyed a massive presence and a favorable role in American sport shooting and hunting in the past three decades, following many years of being a mildly popular round. 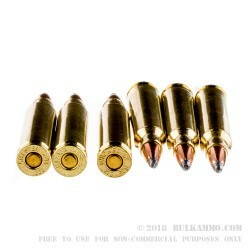 A 64 grain weight bullet is best suited for the intermediate barrel twist rates from 1:8 through 1:10 and while you can expect decent performance out of just about any barrel twist, it is these core 3-4 twist rates that really showcases the rounds potential for accuracy. This is suitable for use in any .223 Remington firearm, but is exceptional in bolt action firearms with the intent of field use for hunting.